We were a 'virtual' African violet club. We closed the forum in April 2018, and this site will be an archive of the best of the best information to help future growers of African violets. This is a corner set aside just for you. If you are just beginning to learn about African Violets you've come to the right place. We can help with information on the basics you need to know to grow happy, healthy plants like the one shown above. We’ve all been there and we’ve all asked the questions you will be asking. Please feel at home here and ask us any questions you may have pertaining to African Violets using the Violet Voice message board. These are your pages. Make your own discoveries. Please use the links below for further information. Many more pages not yet listed here~!! Please 'Search By Topic'. 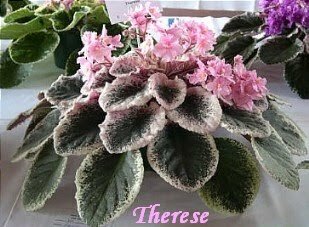 The Violet Voice is pleased to present an interview about that unique african violet hybrid called the Wasp. Some people love them and others wonder what anyone sees in these strange plants. Whatever the case, our interview with David Senk is certainly interesting and you are about to see some new wasps and other very unusual plants. Forum is Closing... VioletVoice.com will be expanded! While the VV Forum is closing.... the many pages of information and educational discussions that are WORTHY of archive, will be saved. The forum closure is effective April 1, 2018... and mid-summer, VioletVoice.Com will be online with expanded content. There are many charts, articles, interviews from the original MSN group and from the Yuku forum that will be available. THANKS to all who worked so many hours to create the FUN we had for fifteen years!!!! Sign Up for UPDATES... and check back this summer! You will receive an email from FeedBurner to confirm that you do indeed want to receive posts from this group. You will have to confirm that you do want to be added to our email list. I do not plan to post until I have the VV archive ready, and I don't see anyone's emails, so it won't create spam for your inbox! We also have a Facebook page, if you wish to follow us there. Photos and original informational articles and illustrations remain property of the authors.